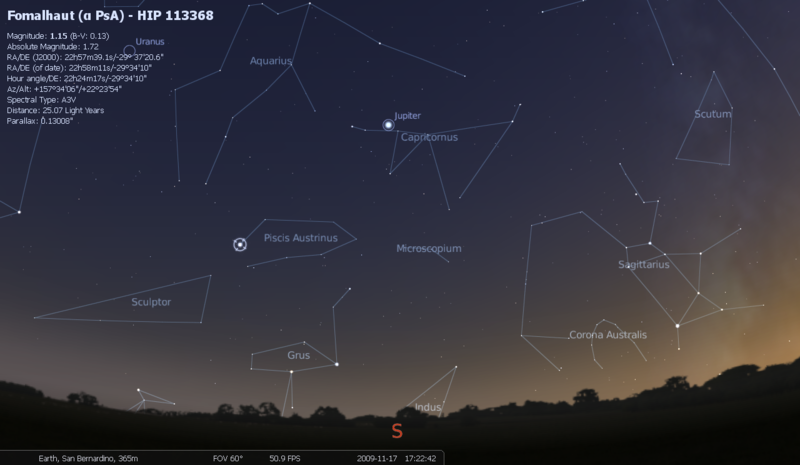 Instructions: Go outside after sunset, face south, and find Jupiter. South and east (or down and left) of Jupiter is a bright star called Fomalhaut. Fomalhaut is the only bright star in that part of the sky, so there’s little chance you’ll confuse it with anything else. It’s not a double star, doesn’t have a striking color, and isn’t part of a striking pattern (it’s also pretty far south, at roughly the same elevation as Sagittarius, so if you’re at high latitudes, good luck). Its attractions are entirely cerebral. 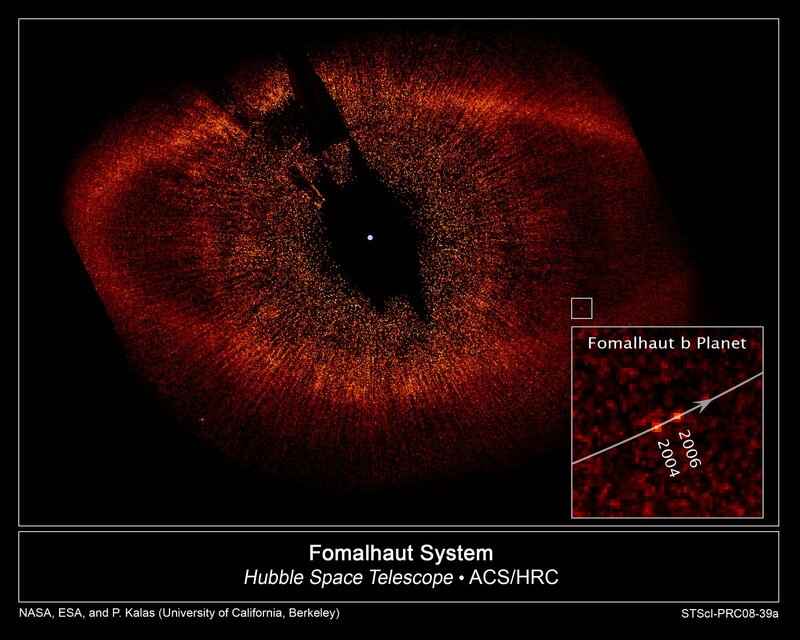 Fomalhaut is special because it has an extrasolar planet, Fomalhaut b, which was the first extrasolar planet to be imaged directly by an optical telescope. What’s all that mean? People had been detecting extrasolar planets for years, by measuring the wobble they induced in their parent stars, or measuring the light drop in their parent stars as the exoplanets pass in front of them, and the spectra of exoplanets had even been obtained, but Fomalhaut b was the first to have its picture taken. The Hubble image itself is cool; it looks like the Eye of Sauron. Hubble image at top from NASA, artist’s reconstruction above from the Joint Astronomy Centre. Apologies to Niven and Pournelle for nicking their title. You are currently browsing the 10 Minute Astronomy blog archives for the day Tuesday, November 17th, 2009.